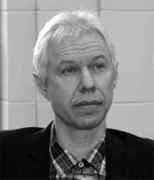 Artūras Dubickas is a Chief Research Fellow at the Department of Probability Theory and Number Theory of Vilnius University's Faculty of Mathematics and Informatics. His main area of interest is Number Theory. Artūras Dubickas was born in 1964 in Tauragė, a city in western Lithuania, not far from the Baltic Sea. His father Kazys Dubickas was an electrical engineer and his mother Elena was working as an economist. Arturas and his younger sister Asta were the only two children in the family. Arturas was a student at Taurage's 1st Secondary School from September 1971 to June 1982. He was quite good at all subjects, hence from fifth grade he decided to start participating in his school (and later, town) mathematical competitions. However, as his teachers have later admitted, at that time Arturas was not capable of writing the solutions to the problems in a way teachers could understand them, so his first success at the Olympiad was only in Year 9. Then not only did he get into his school team, but also took first place in the regional Olympiad in Siauliai University. This was the moment when he became more interested in mathematics. Arturas' mathematics teacher Rene Barsciauskas saw his curiosity and gave him a collection of old 'Kvant' journals (a science magazine in physics and mathematics for high school students in the Soviet Union). At home and during mathematics lessons Arturas used to solve problems from the magazines and various mathematical books he bought himself, since the usual school course was already known to him. By reading those books he independently prepared for the Mathematical Olympiads; his highest achievements were two first places in the Lithuanian Mathematical Olympiad (Year 10 and Year 11) and second place in the Soviet Union Mathematical Olympiad (Year 11). In 1982 Dubickas graduated from Secondary School with a Gold Medal and in September of that year matriculated at Vilnius University Mathematics Department. At that time, the two best students from the course would get the opportunity to continue their studies in the best Soviet Union universities with the condition that they would come back to become lecturers at Vilnius University. So, in September 1983, Arturas took this opportunity and started his second year of studies at the M Lomonosov Moscow State University. He took up extracurricular courses in several subjects including number theory and decided to continue his research in this area. In his third year he chose to study in the Department of Number Theory. His scientific advisor was professor Naum Iljich Feldman, who at that time was teaching a course on approximation of algebraic numbers. Aruras attended that course, and after a year wrote his first scientific paper Approximations of the Logarithms of Some Numbers (in Russian, published in 1986). His second paper Approximation of π/√3 by rational fractions was published in 1987 in the Moscow University Mathematical Bulletin. In June of the same year he graduated from the university with honours and in November started his Candidates degree studies (equivalent to a Ph.D.) in the Department of Number Theory, Faculty of Mechanics and Mathematics of Moscow State University. In two years Dubickas attended his first mathematical conference in Minsk, Belarus: Constructive Methods and Algorithms in Number Theory. In 1990 he defended his PhD dissertation Approximation of some Algebraic Numbers and Logarithms of Algebraic Numbers. The best result of the thesis was an effective upper bound on the distance between the integer powers of 3/2 and the nearest integer, a problem related to so-called Waring problem in additive number theory. At that time, the Soviet Union had started to collapse. Job positions that were created and funded by the government (including work at the university) were much less paid than the ones in the private sector. Mathematicians were highly desired in private industry. Hence most of Dubickas's fellow classmates started working in various businesses and banks, due to higher salary (they could earn 10-20 times more than doing scientific research). However, Arturas strongly wanted to be a scientist. Therefore, at the end of 1990 he came back to Vilnius University and started an academic career. Dubickas's first appointment was as an Assistant Professor in the Department of Probability Theory and Number Theory, a position he took up in December 1990. He had a lot of teaching hours at that time, so after applying to several universities he was offered a postdoctoral position at the University of Witwatersrand in Johannesburg, South Africa, which he took up in February 1992. There he worked on several papers: On improving the approximation of π/√3 by rational fractions (1993), which was a continuation of the work he had presented in his Ph.D. thesis, and On a conjecture of A. Schinzel and H. Zassenhass (1993) where he obtained a new bound on a well-known problem of Andrzej Schinzel and Hans Zassenhaus related to Lehmer's problem which had been open since 1933. Two years later Arturas came back to his career in Vilnius University. From February 1994 to August 1998 he was a Research Fellow at the Department of Probability Theory and Number Theory and, in December 1998, he became a docent. Then for a year he worked as Senior Research Fellow, in the meantime he also defended his habilitation: Distribution of algebraic numbers (February 1999). In August of the same year he was promoted to Chief Research Fellow at Vilnius University and at the Institute of Mathematics and Informatics (part time job); in December 2001, he also became a Professor and he continues these duties to this day. In September 2016, he became the Chair of the Department of Probability Theory and Number Theory. In total Dubickas has published about 200 papers, and he is still publishing papers regularly. His works are published in more than 100 mathematical journals such as Advances in Mathematics, Proceedings of the American Mathematical Society, Mathematical Proceedings of the Cambridge Philosophical Society, Bulletin of the London Mathematical Society, Mathematische Zeitschrift, Israel Journal of Mathematics and many others. Most of his papers are written as single author works, however some of them have coauthors from all over the world: USA, Canada, UK, France, Israel, China, Russia, Portugal, etc. Throughout his career he has participated in more than 60 mathematical conferences and seminars, including scientific visits to some famous universities, such as Cambridge University (Cambridge, UK, 1999) and Max Planck Institut für Mathematik (Bonn, Germany, 2002). Outstanding mathematical achievements of Dubickas were noticed by the scientific community, and as a result he was awarded the Rector's Prize for Outstanding Scientific Achievements three times (in 2002, 2006 and 2013). He was also given the National Science Award of Lithuania in 2006 for the cycle of papers 'Distribution of Algebraic Numbers' (1986-2005). It is important to mention that a few Dubickas's papers are included and quoted in the databases of scientific web pages, such as Wolfram Research MathWorld - (3 papers) (see ), The ABC Conjecture - (1 paper) (see ), and Page dedicated to Lehmer's Problem - (25 papers) (see ). Besides being an active scientist, Dubickas is involved in organizing Olympiads for young mathematicians. Being the head of the evaluation committee for the National Lithuanian Mathematical Olympiad, his responsibilities include selecting the problems for students and making sure that they are fairly evaluated. Then the best students are given a chance to take part in the International Mathematical Olympiad (IMO). Every year since 2007 Arturas has been a Lithuanian team leader at the IMO, where he defends students' solutions to the problems. Since then, from 2007 until 2016, Lithuania has won 30 medals including the only gold medal for Lithuania in 2007 (won by Kestutis Cesnavicius, who later did his PhD at the Massachusetts Institute of Technology and now has a post doctoral position at University of California, Berkeley). In addition to this, Dubickas is also a team leader of Vilnius University at the Vojtech Jarnik Mathematical Competition for students. Since 2013 every year he brought the Lithuanian team to Ostrava, Czech Republic, where the competition is held. Dubickas strongly believes that it is important to encourage young mathematicians to test and apply their problem solving skills, strive for the best education and, later on, maybe contribute to the mathematical community. In total Dubickas has been a scientific advisor for seven students (between 2008 and 2013), all of whom defended their PhD theses. Five of his students are now working in Vilnius University, one (Jonas Jankauskas) obtained a post doctorial position at University of Waterloo (Canada) and now has an academic position in Austria. Three dissertations written by Dubickas's students were selected as the best dissertations of the year in a competition organized by Lithuanian Society of Young Researchers (Paulius Drungilas, Heights of Algebraic Numbers, in 2008, Jonas Jankauskas, Heights of Polynomials, in 2012 and A Novikas, Composite Numbers in the Sequences of Integers, in 2012). Jankauskas' dissertation was also nominated for the International Banach Prize, and it ended up among the top five best dissertations. Overall, Dubickas is actively involved in the mathematical community and does not only partake in scientific, but also editorial and organizational work. Arturas was a committee member of numerous international conferences, for example, he organized the 27th Journées Arithmétiques in Vilnius in 2011, and he does editorial work for various mathematical journals, such as the European Journal of Mathematics, The Central European Journal of Mathematics (until 2014), Uniform Distribution Theory, The Lithuanian Mathematical Journal and the Siauliai Mathematical Seminar. He has won several awards for his outstanding contributions including the Rector's Prize for Outstanding Scientific Achievements in 2002, 2006 and 2013, and the National Science Award of Lithuania for 2006 awarded for the cycle of papers Distribution of Algebraic Numbers (1986-2005). Dubickas's daughter, Leticija Dubickaite, is currently (2017) an undergraduate mathematics student at the University of St Andrews, Scotland.